Whilst my elfin cousins are off galavanting with Old Saint Nick, for me Christmas in the woodland is a time to kick back and mull over the last year. What’s been getting people talking, which studies have been most relevant to practice, where have unfounded claims been made, and what have we learnt that can help us improve what we do next year. So, whack on the Vince Guaraldi Xmas soundtrack and join me for a review of the last year in our neck of the woods. Stephen Wood appraised the SEYLE cluster RCT: a groundbreaking large-scale European study of universal interventions for suicide prevention in schools. Andrew Shepherd thoughtfully reviewed a systematic review of antidepressant withdrawal symptoms after SSRI discontinuation, which led him to reconsider his own clinical practice. Mindfulness-based cognitive therapy (MBCT) to prevent depression. My own blog of the PREVENT RCT of mindfulness for the prevention of depressive relapse or recurrence. The start of a personal mindfulness journey for me this year, which included a summary of mindfulness evidence in my #MHAW15 blog, an EBMH hangout and an appearance on the BBC All in the Mind show. Can psychotherapy reduce the risk of relapse or recurrence of depression? Sarah McDonald drew on years of pizza-making experience when she appraised a systematic review of psychological interventions to prevent depression relapse. Crisis of faith? Instead of CBT, we should be worrying about meta-analyses. Ioana Cristea put her tip-top critical appraisal skills to good use in this blog that questioned the objectivity and reliability of meta-analyses. Does tobacco use cause psychosis? Marcus Munafo helped us get our heads around the emerging evidence linking daily tobacco use with an increased risk of psychosis and an earlier age at onset of psychotic illness. Integrated treatment for first episode psychosis: media hype versus reality. Alex Langford was warmly welcomed back to the woodland as he reflected on the media hype surrounding the NAVIGATE RCT, which looked at a comprehensive, multidisciplinary, team-based treatment approach for first episode psychosis. Work Capability Assessments linked with increase in suicides. Ian Cummins considered the shocking findings of a longitudinal study on the impact that welfare reform and disability assessments have had on mental illness and rates of suicide. A fantastic debut blog from Olivia Kirtley and Alys Cole-King who shared their extensive knowledge and expertise about suicide risk assessment and intervention in people with mental illness. 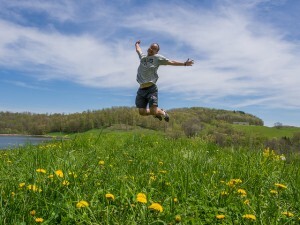 Which Mental Elf blogs made you jump for joy this year? One of the main objectives of the Mental Elf and my woodland cousins who cover social care, learning disabilities, commissioning, dentistry and musculoskeletal health, is to help you engage more with research in your every day life. We want to get high quality evidence into practice and helping you to find, read and use research is clearly a big part of this. Of course, there are lots of barriers to using research in practice if you’re a health or social care professional (e.g. time, access to the evidence, critical appraisal skills etc). This year we’ve embarked upon two major initiatives that we are really proud of. Both are social media friendly and aimed at frontline health and social care workers. #WeCATS Critical Appraisal Twitter Sessions! Read Teresa’s introduction to #WeCATS here. We’ve covered a couple of mental health topics already (mindfulness for recurrent depression and suicide prevention in schools) and have more planned for next year. The discussions are sometimes live broadcast and everyone can join in with the debate on Twitter by using the #ElfCampfire hashtag. It’s a great interactive way to learn about new evidence from the comfort of your own desk/sofa/treehouse. We have lots of campfires planned for next year, so keep your eyes peeled for announcements about those soon. 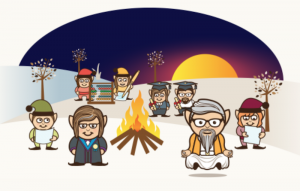 Join us around the campfire in 2016! Springtime this year saw a major step forward for us elves as we launched our National Elf Service website, which brings together all of our health topics into a single database. This makes it easier for you to use any elves that are relevant to your work, e.g. 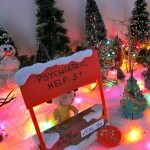 mental health social workers are likely to find the Mental Elf and the Social Care Elf both very useful. The website boasts lots of fun CPD features so you can keep track of your learning and download certificates to put in your professional development file. You can keep private reflective practice notes, set up alerts to highlight new evidence and connect with experts in your field of interest. Sign up for our 2-week free trial to get full access. Individual and institutional subscriptions are now available, so tell your librarian, training manager or CPD lead to get in touch with us to discuss the National Elf Service membership features. The Minervation ethos has always been to bring together people to co-design and build websites and apps that can help bridge the gap between research and practice. An essential component of this is to evaluate what we do from the word go. We’ve been coproducing our National Elf Service since day one and we’re always on the look out for new partnerships that can help us evaluate and improve on what we do. So we are immensely grateful to Andrea Cipriani, John Geddes and the various staff at the Oxford Health NHS Foundation Trust who have helped us evaluate the website this year. Our ultimate aim is to inform clinical decision making and improve patient care through better use of evidence, and it’s only by collaborating with patients, care-givers, researchers and practitioners of all shapes and sizes that we are able to test that what we are doing is what you all need. Hi ho, hi ho, we coproduce you know. A special word of thanks goes to our Project Coordinator Dochka Hristova who has been a key member of the woodland team for most of this year. Dochi is now moving on to pastures new, so we all send good wishes and much gratitude for a fantastic job over the last few months. Any enchanted woodland is only as good as its pointy-eared inhabitants, so I wanted to take this opportunity to wish all of our bloggers, readers and followers a very Merry Christmas and a peaceful New Year. The woodland would be a very cold, drab and uninteresting place without you. So a very special thank you for your ongoing hard work, support and dedication to the woodland ethos. Come here and give us a kiss! Hi #WeCATS chums @WeNurses @CASPUK @UKCochraneCentr You’re mentioned in our 2015 review https://t.co/JYRUvcCvt5 Happy Xmas! @StephenWood8 @shrinking81 @Zia_Julia @MarcusMunafo You’re all mentioned in our 2015 review https://t.co/JYRUvcCvt5 Happy Xmas! @PsychiatrySHO @IanCummins9 @LivveyKirtley @AlysColeKing You’re all mentioned in our 2015 review https://t.co/JYRUvcCvt5 Happy Xmas! @Mental_Elf @PsychiatrySHO @IanCummins9 @LivveyKirtley Happy Xmas all! Morning @And_Cipriani @OxPsychiatry You’re mentioned in our 2015 review https://t.co/JYRUvcCvt5 Happy Xmas! Charlie Brown meets Olivia Newton-John is our end of year review https://t.co/JYRUvcCvt5 Happy Xmas everyone! Don’t miss: Top #MentalHealth blogs in 2015 https://t.co/JYRUvcCvt5 Merry Xmas everyone! RT Mental_Elf Don’t miss: Top #MentalHealth blogs in 2015 https://t.co/1a2ez0K9Lr Merry Xmas everyone! Looks like I have a lot of reading to do now. Thanks for a great post!